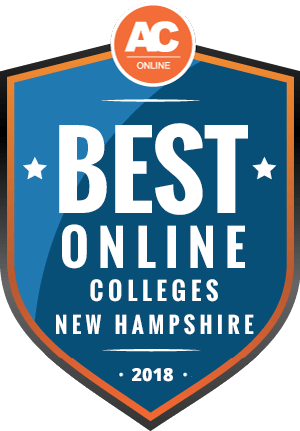 Why Choose New Hampshire for Online Higher Education? According to the state’s Economic and Labor Market Information Bureau, New Hampshire faces a significant labor shortage, with many employers struggling to find qualified candidates to fill open positions. While this shortage should improve prospects for job seekers, many of the fastest growing occupations in the state still require some kind of postsecondary education. Online colleges in New Hampshire can help position you to take advantage of these new opportunities. This page provides an overview of online programs in the state, including tuition rates, information on transferring credits, and applying for financial aid. It also includes a ranking of the most affordable online schools in New Hampshire. You can review a list of some of the best and most affordable online colleges in New Hampshire below. To compile this ranking, we examined factors such as tuition rates, discounts for in-state residents, and financial aid opportunities. We also compared the quality of online institutions in the state, using data on graduation rates, student-teacher ratios, and the availability of student services. Finally, all colleges and universities on this ranking hold either regional or national accreditation. *PBV: is a proprietary metric that compares the cost of a program to the cost of other programs with the same (or a similar) qualitative score. It also compares the qualitative score of the program to the score of other programs with the same (or similar) cost. In short, the PBV calculation denotes the overall value – or ‘bang for your buck’ – of an online degree. The table below uses data from the Integrated Postsecondary Education Data System to show the scope of online higher education programs in New Hampshire. As distance programs give students the ability to learn on their own schedule and from the comfort of their own homes, they often cater to working professionals, single parents, and those living in more rural parts of the state. Online education can also help those looking to change direction in their careers. The cost of attending an online program in New Hampshire depends on a few factors, including whether or not you live in the state. At the University of New Hampshire, for example, in-state students pay $800 per credit to earn an online MBA, whereas those living outside of the state pay $910 per credit. To qualify for in-state tuition at most schools, you must prove legal residency in New Hampshire for at least 12 months prior to your enrollment. Through the New England Board of Higher Education’s Tuition Break Program, residents may qualify for tuition discounts if they attend school in New Hampshire. Students in New Hampshire typically pay more than the national average when pursuing an undergraduate degree at a public college or university. Your choice of school affects the total cost of your education considerably. For example, you can earn an associate degree at a community college for significantly less than a bachelor’s degree at a public university. Private institutions often charge even more, and many do not provide in-state tuition discounts. In 2016, roughly 58,000 out-of-state students pursued a postsecondary degree in New Hampshire. Many of these students received discounted tuition through the New England Regional Student Program. To qualify, you must be a legal resident of either Connecticut, Maine, Massachusetts, Rhode Island, or Vermont for at least 12 months prior to your enrollment. You must also choose one of the more than 900 associate, bachelor’s, or graduate programs that participate. Members of the armed forces and their families may receive waivers from these residency requirements. Just over 80 public colleges and universities participate in the New England Board of Higher Education’s Tuition Break Program. Through this program, students can receive discounted tuition to programs not available in their home state. For instance, no medical schools currently exist in Maine, so the program allows them to pay the equivalent of in-state tuition at the Tufts University School of Medicine in Massachusetts. Students may also qualify for discounted tuition if the closest school to them lies across a state border. Some students in western Massachusetts, for example, may live closer to a college in southern Vermont or New Hampshire. Most public online universities in New Hampshire participate in the State Authorization Reciprocity Agreement (SARA), so students from the District of Columbia and 49 other states can earn a degree from these institutions at a distance. Some private institutions, such as New England College, also participate in SARA. Many larger schools, including the University of New Hampshire, have entered into individual reciprocity agreements with states not yet fully participating in SARA, such as Florida and California. This next section offers answers to some of the questions most commonly asked by students considering whether to attend an online college in New Hampshire. While the information below generally applies to programs across the state, make sure to check with individual schools about exact costs and start dates. Do Online Credits Cost More or Less in New Hampshire? The cost of pursuing an online degree in New Hampshire depends significantly on your choice of school. For example, you can expect to pay more by attending an elite institution like Dartmouth College than you would at a less selective school like Southern New Hampshire University (SNHU). Dartmouth charges approximately $1,200 per credit to earn an online master’s in public health, while SNHU charges only $627 per credit for that same degree. Students attending a public university in New Hampshire generally spend less than those attending school in other New England States. The University of New Hampshire, for instance, charges $715 per credit for out-of-state residents pursuing a master’s in education, while the University of Massachusetts Boston charges almost $1,500 per credit at the graduate level. Make sure to factor in other expenses when considering the overall cost of your education, such as technology fees and book prices. Which New Hampshire Schools Accept the Most Transfer Credits? Many public colleges and universities in New Hampshire boast generous transfer policies, especially for students who begin their undergraduate education at a community college in the state. Students attending any of the schools in the Community College System of New Hampshire can receive up to 72 credits towards their bachelor’s degree at institutions like Keene State College, Plymouth State University, or the University of New Hampshire at Manchester. Applicants who previously attended a four-year school in New Hampshire may transfer up to 96 credits towards a bachelor’s at a state university. Private institutions set their own rules for transferring credits. Southern New Hampshire University, for example, accepts up to 90 credits towards a bachelor’s degree and even provides a free credit evaluation to help applicants determine exactly how many credits they can transfer. Franklin Pierce University, by contrast, evaluates transferable credits only after a student earns admission into one of its programs. Elite universities in the state, such as Dartmouth College, may only accept credits from other regionally-accredited institutions. To begin your research, review the information on the NH Transfer website. You should also contact your chosen program directly to learn more about the type of credits they accept and their unique transfer process. Will Any Online Colleges in New Hampshire Accept a GED? Passing the General Educational Development (GED) tests serves as a signal to colleges and employers that an individual possesses high school-level academic skills and knowledge. As such, almost all colleges and universities in New Hampshire allow undergraduate applicants to hold a GED rather than a high school diploma. Students with a GED, however, may face a steeper climb than those who graduated from high school. Dartmouth College, for example, does not specifically require applicants to have a diploma, but it does consider the academic rigor of a student’s high school curriculum when making admission decisions. Public institutions such as the University of New Hampshire also allow applicants with a GED, but they may require results from the SAT or ACT as additional proof that you can succeed academically in college. If you have a GED, try to strengthen your application by doing well on these standardized exams, obtaining multiple letters of recommendation, and crafting a strong personal essay. How many academic terms per year do online colleges in New Hampshire offer? Southern New Hampshire University (SNHU) allows students to begin their studies at any one of six start dates throughout the year, or roughly every other month. New England College similarly features six terms per year, meaning students can start taking classes whenever is most convenient for them. The vast majority of other online colleges in New Hampshire, including private schools such as Rivier University and the entirety of the state’s public university system, require distance learners to enroll in their courses at the same time as on-campus students. Typically, this means you must begin a program either at the beginning of the fall semester in September or at the beginning of the spring semester in January. Some universities that offer summer classes may also allow students to enter a program in July. Which Online Colleges in New Hampshire Will Accept the FAFSA? The Free Application for Federal Student Aid (FAFSA) determines your eligibility for several forms of financial support. Depending on your expected family contribution, you may qualify to receive federal grants, such as the Pell Grant, or participate in the Federal Work-Study Program, which provides jobs to undergraduate and graduate students on campus to help them pay for educational expenses. After completing the FAFSA, you may receive eligibility for low-interest student loans from the federal government or need-based grants and scholarships from your home state. All regionally and nationally accredited institutions can receive federal financial aid awarded through the FAFSA process. Almost all online colleges in New Hampshire hold one of these two forms of accreditation, but make sure to check the Council for Higher Education Accreditation’s online directory to confirm your chosen program is listed. Are There Any Free Online Classes I Can Take From New Hampshire Colleges? Generally speaking, no, you cannot take any free online classes from New Hampshire colleges and receive credit towards a postsecondary degree. You can, however, take free Massive, Open, and Online Courses (MOOCs) offered by DartmouthX, a partnership between Dartmouth College and the edX online learning platform. Through DartmouthX, you can take college-level courses covering topics such as John Milton’s Paradise Lost, the foundations of the C programming language, Italian opera, and environmental science. While these courses offer students the opportunity to experience an Ivy League education and sample a potential course of study, you cannot receive credit from Dartmouth College for completing one of their MOOCs. Many colleges and universities offer students the opportunity to sample an online course during its first week, also known as a “shopping period.” Some schools may allow online students to enroll in a class for a certain length of time without needing to pay anything in tuition, so long as they withdraw from the course before a particular date. Students who do not withdraw before the introductory period ends must pay the full tuition cost for the course. Check with the specific school to determine their policies for sampling online courses. How Can I Find the Online Program Options at New Hampshire Colleges? The University of New Hampshire Online serves as the primary resource for public online programs in New Hampshire. Through UNH Online, distance learners can pursue bachelor’s, master’s, or doctoral degrees in a variety of fields, such as education, nursing, and business administration. If you do not want to commit to a degree program, you can also take online courses towards a graduate certificate or for professional development and training purposes. UNH Online offers resources for students considering online education, including a survey to help you determine if distance learning is right for you. With more than 90,000 online students, Southern New Hampshire University acts as the largest private provider of online degrees in the state. SNHU provides resources to help prospective students better understand the online learning experience, including FAQs about online classes, testimonials from students and alumni, and descriptions of the services available to online students. In addition to federal financial aid, many private organizations offer scholarships specifically to students pursuing a postsecondary degree in the Granite State. While many of these organizations award funds based on financial need, others support students who excel academically or those from a particular socioeconomic background. We detail five scholarships available to students attending online colleges in New Hampshire below. The NHCF awards scholarships to students pursuing an associate degree at one of the state’s community colleges or another two-year institution. To qualify, you must hold a high school diploma or GED and demonstrate financial need. NHCF prefers to support students planning to enter a high-demand profession, such as engineering or clinical health care. NHCF also supports students pursuing their bachelor’s degree from a four-year college or university in the state. In making their award decisions, NHCF considers financial need, academic merit, community service activities, and professional work experience. The program is highly competitive, with roughly five applications for every award. Finally, NHCF also provides scholarships to students seeking either a master’s or doctoral degree. To qualify for a graduate scholarship, you must hold a bachelor’s degree and demonstrate exemplary academic achievement, pressing financial need, and deep involvement in your community. The Community Colleges of New Hampshire Foundation administers ten scholarship programs for students pursuing an associate degree or professional certificate. The NASA Space Grant Scholarship, for example, supports students majoring in a field like aviation technology or advanced manufacturing technology. The foundation selects recipients based on financial need and academic merit. The Stephen Phillips Memorial Scholarship Fund provides renewable awards to students from New England seeking their first bachelor’s degree. To qualify for funding, you must maintain at least a 3.0 GPA during high school, report an expected family contribution of $10,000 or less, and demonstrate both leadership skills and a desire to make meaningful contributions to society.